Distinguishing Characteristics Caucasian female. Red hair, brown eyes. Amici has a hysterectomy scar on her abdomen and a vaccination scar, slightly larger than quarter-sized, on the outside of her upper arm. She wears eyeglasses with gray frames and artificial diamond decorations. Her ears are pierced. 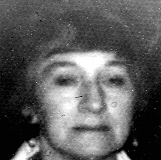 Amici was last seen leaving her workplace in the 37000 block of 47th Street east in Palmdale, California at 10:00 p.m. on October 3, 1978. She has never been heard from again. On October 5, her granddaughter checked her home and discovered all the doors were unlocked and the lights were on. There was no sign of Amici and all of her belongings were still at the residence. She is considered missing under suspicious circumstances. Updated 1 time since October 12, 2004. Last updated August 10, 2011; casefile added.